Reagan scholar Dr. Kiron K. Skinner says the absence of a strategy is why President Obama’s recent speech at West Point fell flat for many Democrats and Republicans. As a warning to adversaries, it lacked credibility. Barry Goldwater: The man who made Reagan possible. Fifty years ago, Barry Goldwater won the Republican presidential nomination as a man of controversy. Today, he can be seen as something else entirely: vindicated. Eric Cantor lost to the modern Gipper, Dave Brat. Make no mistake. The Tea Party is not dead, and Reagan conservatism lives. There have been four great Republican electoral triumphs in the past half century; Ronald Reagan in 1980 and 1984, the Contract with America in 1994, and the Tea Party revolution in 2010 and as I explain in my new book TAKEOVER there’s a theme common to all of them. 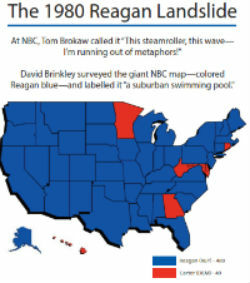 By not engaging in backbiting with other Republicans, Reagan was able to appear to conservative Democrats as someone different from other Republicans. Which he surely was. By first covering CPAC in a disparaging way the liberals at The Washington Post, or the Washington “Compost” as it is known to DC area conservatives, helped make CPAC the mega-conference it is today and launch other conservative endeavors, including Sarah Palin Radio.